Following the Stephenson conference held in London earlier this year, Comtest Wireless is now making the paper it presented, available to the industry. The paper evaluates the technical and operational challenges in designing a telematics architecture for the continuous, on-board monitoring of operational performance of assets across an entire railway network. Rail networks are sophisticated systems that require the cohesive cooperation of many different and disparate components in order to operate effectively. A failure to do so introduces delays, reduces customer satisfaction and increases operating costs and penalties. 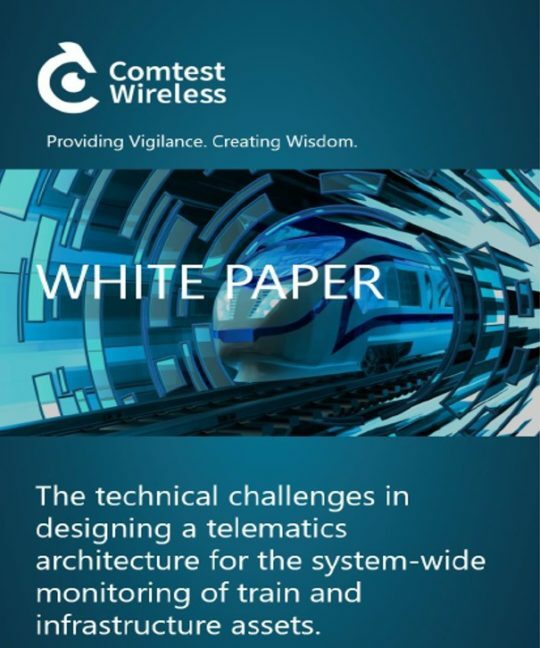 The ‘Train as a Sensor’ is a reality; continuous asset component monitoring significantly increases on-board data volumes and requires maximising wireless bandwidth capacity for remote data collection and analysis. That is because over the past 20 years, the wider world of IT technology, cloud services, digital and wireless communications have all made significant advances. Big Data offers the prospect of processing massive data volumes in real-time. 4G and soon 5G networks offer the levels of communication bandwidth, throughput and latency that were normally the realm of connected LAN and WAN networks. These technologies merged with the Internet, low cost connectivity, and low cost sensor technology, are now driving what has become known as the Internet of Things (IoT). Rail as a market segment has been conservative in its adoption of new technologies, and has proven to be a complex environment for the approval of new standards and regulations. Safety has the primary consideration in the introduction of IT and technology, but also attributes such as reliability and robustness in harsh environments must be considered. This paper discusses the design of on-board connectivity devices for remote wireless data transfer over 2G, 3G and 4G networks, plus on-board appliance design for intelligent logging, caching and synchronisation of measurement data. Please click here to request a copy of the paper.